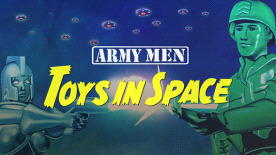 Finally, proof that little green men exist in outer space! Enter Tina Tomorrow and her battalion of Space Troopers. Joining forces with the Green Army, they freeze, zap, vaporize, and blast their way through the bathroom and into outer space with the hopes of destroying the diabolical alliance in the name of good. Two additional races of toys - The Galactic Army of Stunners, Paralyzers, Gunners, and Incinerators and the Alien Army of Larvae, Spiders, Drones, and Commanders. New worlds to explore - Including a city on a space planet, a bathroom, a sandbox, and a backyard picnic. A cool selection of weapons - Fight with silenced rifles, incendiary grenades, napalm, heavy paratroopers, freeze rays, laser guns, fly-swatters, and even glue.